It was a dark and stormy night, and once again, we woke up at 4:30 when it started to get light outside. Rain and wind rattled the roof through the night, but we slept fine, and lazed in bed for quite awhile wondering how to start our day. Breakfast was scheduled for 7:30, and the hot bath was open in the morning (unusual, baths are normally not a morning affair), so we took a soak before breakfast, then I downloaded photos and spend half an hour adjusting the timestamps on the photos for the last few days--doh, I forgot to set the timezone on the camera. I checked the weather--60% rain in the morning, 10% in the afternoon--and we lingered a bit, taking breakfast slow. It was a Japanese breakfast with a very tasty BBQ fish, long and thin, and once again I wondered "how do you eat this with chopsticks?" Some dishes are just mystifying as to how to dissect them. A bit of coffee for fuel, and then we were good to go. It was rainy and warm, and I just wore my rain kilt and a thin synthetic T-shirt, and put up the umbrella: for the first time, it was going to deal with rain, not sun! 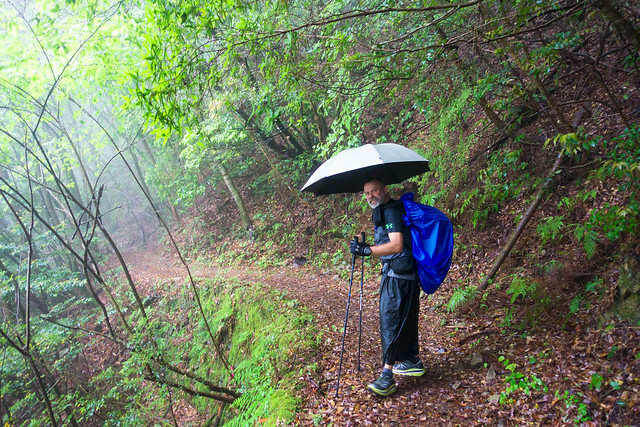 From the ryokan, the trail rose steeply up a paved stone path from Takahara, then fluttered along a ridgeline for many miles, passing a few abandoned shrines and more than a few overgrown fields, and even some modern houses that looked a bit abandoned. Hm? What?? Is this because people are moving out of the rural areas? Is it because Japan's population is rapidly aging? Is it just this region or village? Who knows... it's so simple to generalize when you travel, and so easy to think your exciting new-found experiences reveal some undiscovered truth. Anyways, as we walked along we kind of enjoyed the rain. It wasn't bothersome, and it brought out a few critters to the trail, including crabs. WTF? Mountain crabs? That's like seeing a black swan or something. They scuttled away from us, but a few gave us a closeups. 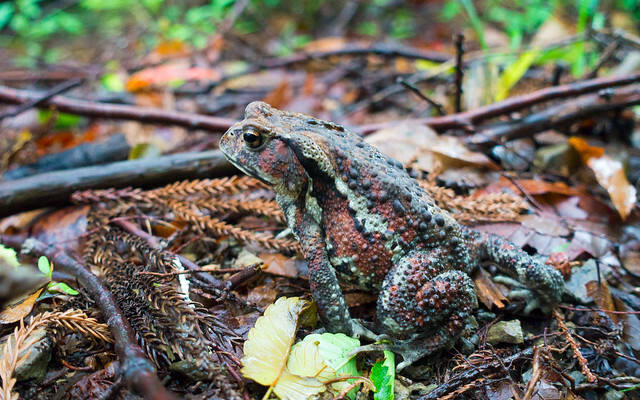 Along with the crabs were plenty of frogs and toads--the frogs skittishly scampering away, and the toads pretending we couldn't see them with their very clever camouflage. I snapped a few pictures of obviously different species, and wondered if they were poisonous and/or edible. 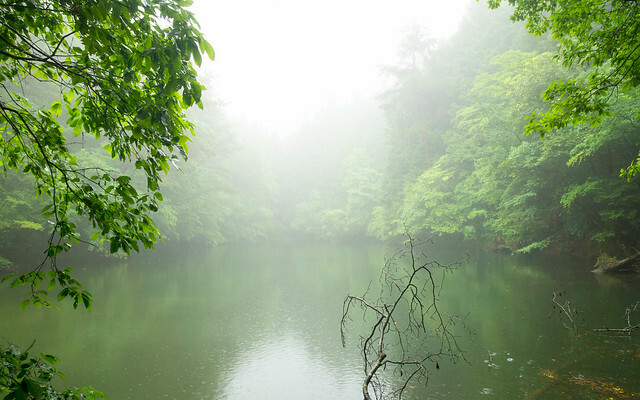 It drizzle-rained for most of the morning, obscuring the views, and we walked through a mixed forest of Japanese maples and conifers (cedar or cypress? 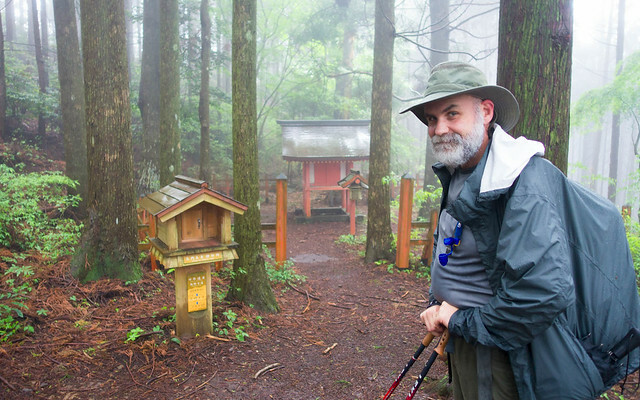 ), past many shrines and houses from 1000 years ago or 100 years ago. 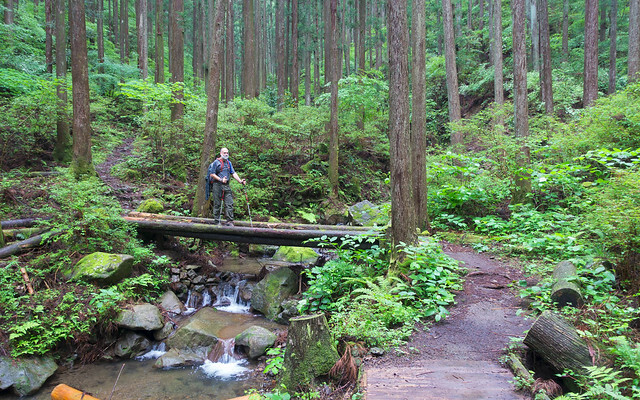 After 8km, we dropped steeply down to a creek with waterfalls that looked straight out of the Pacific Northwest, except for the small clump of palm trees we spotted along the creek which looked out of place but were native. While this area might get a lot of rain, it's at the latitude of Los Angeles and not Portland, and it's known for growing citrus. The slick stone paving was pretty slippery, and we took it real slow to the rest area and small snack/restauarant spot on the road for lunch. After lunch, the sun really came out, and it got warm and humid, as in 28C/82F. 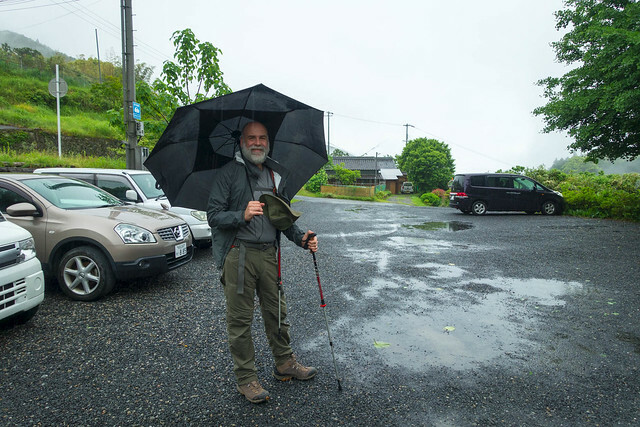 It was a short walk over to our next stop, the town of Chikatsuyu, and we walked over to the supermarket for snacks and supplies. Chris bought a can of Kumano Kodo beer, thinking it was going to be cheap tourist swill, and it was the opposite--really good beer made by a local craft brewery (Japan really doesn't have many, the big brewers really dominate). We checked in at the ryokan at 3pm sharp, took a hot bath to clean up, and Chris went back to the store for more shopping, bringing back some beer we enjoyed at the river's edge next to our lodging. Dinner was served at 6:30, and I opted for the Western seating and not the Japanese mats... my knees just don't bend that way. That was a mistake, we listened to an insufferable retired database salesman from the Sunshine Coast (just a few minutes from Noosa!). He nattered on and on and on about his enterprise database sales battles, how he opened new territory, how the exemplary strategic leadership of the CEO, Larry led the company to victory over and over. Larry's company was the first create a unified HR system and a unified mail system! Larry knew that Americans that are posted in overseas jobs just don't cut it and how he (as an Aussie) did much better as a salesman in China! The poor guy he was blaring at was from Adelaide (yes, they were with wives, but the women just were accessories to this man-conversation). Poor guy tried to add to the conversation about a biotech startup that he sold. The Larry salesman curtly acknowledged the accomplishments from Adelaide then went back to talking about Larry Larry Larry, how Larry is a superachiever and how Larry ran the most successful Americas Cup ever in San Francisco. Biotech guy asked if Salesman had ever visited Larry's house! No, sadly, Saleman hadn't visited Larry's special Japanese house built by Japanese craftsmen without any nails at all. Yeah, it went on like this for over half an hour. I didn't know that Larry Ellison fanboys existed, but this guy was certainly one of them. I wondered if he kept a little shrine to Larry in his house--certainly he probably had a Me Wall of all his sales achievements--and he probably pointed out Larry Ellison's signature on some sales achievement plaque to all his houseguests. Sigh. We really weren't enjoying our dinner, though I found it very tasty, so we gobbled and GTFO. I really did enjoy the food, though--a hotpot like thing on a burner in the middle of the table, with many cubes of tofu and pork and shiitake mushrooms and these other longer mushrooms, making a umami bomb of a stew, creamy and tasty. It's called 'nabe' or somesuch. And right after dinner, just like that, we decided to get to sleep early. We've got a big day ahead of us tomorrow--some 25+ km of walking (say 16 miles), so better rest up.